Singer and producer Park Jin-young is out to prove his relevancy. He will be releasing a digital single “Still Alive” on April 10, JYP Entertainment announced Tuesday. “Still Alive,” which was written by Park, reflects the singer’s perpetual enthusiasm with its uplifting rhythm and melody, added the agency. The singer also released a teaser video on YouTube on Tuesday. In the video, the singer does a spoof of the film “Nameless Gangster: Rules of the Time” (2012). 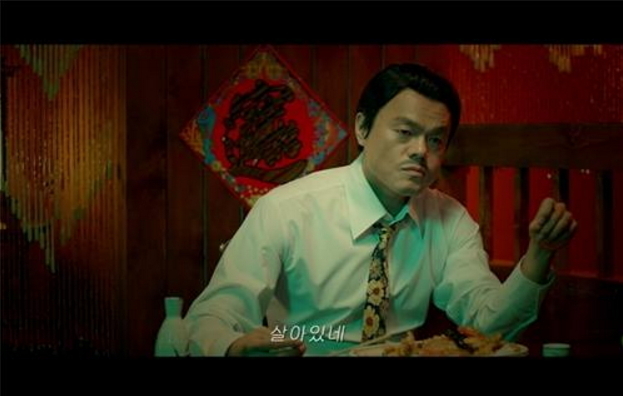 He reproduced actor Ha Jung-woo’s restaurant scene in which he utters the famous line, “Still alive.” The teaser video did not include any music. Park, who is the CEO and founder of JYP Entertainment, debuted with the studio album “Blue City” in 1994. He rose to stardom with “Don’t Leave Me,” the lead song from his debut album. Though it has been 22 years since his debut, Park proved that he is very much “still alive” with his single “Who’s Your Mama,” which slayed charts last year.